The Nikon D5300 is the first Nikon DX-format digital SLR to feature built-in Wi-fi and GPS. 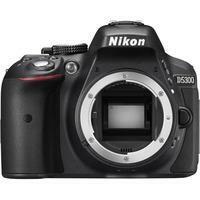 The D5300 sits in the mid-range cropped sensor line-up and is specifically designed for creative enthusiasts who want to document their travels and share their view of the world through high-quality images. The 24.2 megapixel CMOS sensor has been specifically designed with no optical low-pass filter (OLPF) to boost detail and clarity, whilst the 39-point AF system with nine cross-type sensors ensures outstanding accuracy and sharpness. The high ISO sensitivity range from 100-12,800 (exp. to 25,600) and EXPEED 4 processing engine delivers beautifully rendered Full 1080p HD movies and stills, even in low-light. The 3.2" vari-angle LCD screen with 1,037k-dot resolution offers the ultimate freedom to capture self-portraits and unique shots from low-angles.